It has been QUITE awhile since I have written a piece for the “Yeah, I Ate That Series.” I was thinking today about one of my favorite over-the-top dishes back in the Milwaukee area. Daymakers makes The Cyclops. The best way to describe it is like the “Peekhole Sandwich” I wrote about recently on my Mom’s birthday but with a pancake. Make a large pancake, cut a hole in it, stuff it with sausage and egg. Voila! A Cyclops! While not everything on the menu is a magical, mythical creature like the Cyclops, they do offer other fabulous offerings. I do remember grabbing plenty of bites of Brett’s “Pretzel-Bread French Toast” that is served with peanut butter syrup. To learn more about Daymaker Cafe or to view their menu, visit www.daymakercafe.com. 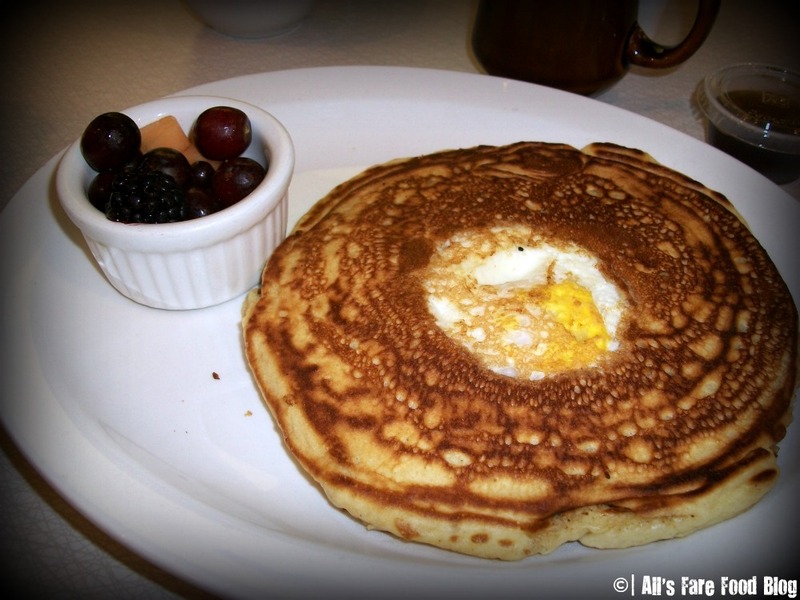 This entry was posted in Cuisine - American, Places - Milwaukee and tagged breakfast, Cyclops, Daymaker Cafe, maple syrup, pancake, photos, pretzel bread french toast, Wauwatosa by Christina. Bookmark the permalink.